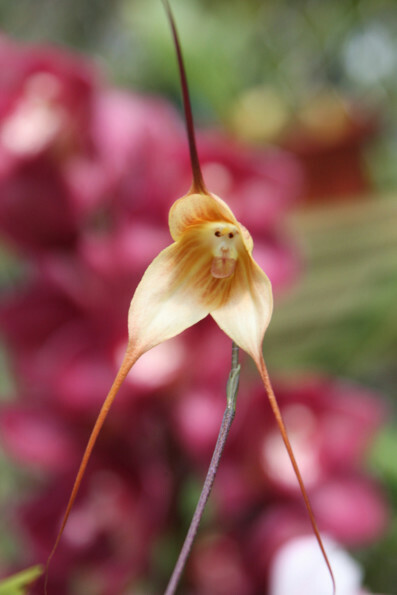 This is the rare Monkey Orchid, found only in high elevations of Ecuador and Peru. The primate-esque flowers are formally known as Dracula simia, but I like to keep things casual. Like, really casual. Last week I got sent home early from work for wearing PJs to the office. I was like “C’mon, it’s casual Friday!” and the HR lady was all, “It’s Tuesday.” She suggested I start showing up for work BEFORE lunch and NOT reek of tiki drinks, which is completely rude. This is who I am — I will not be oppressed by the man! 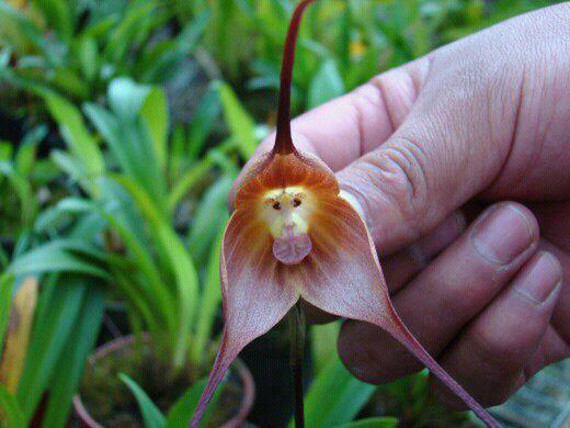 i love this monkey orchid picture i wont one how to get one?i just never seen this before are i would have remembered it. thanks i wont to get a picture and frame it too. @Rikeus, evolution does not exist. There’s a video out called Programming of Life. Find it on YouTube. It explains about how everything inside the DNA strand dictates what proteins are manufactured, where they go, how they are used, and there is nothing at all that’s left to chance in the cellular design. That degree of information could not happen through natural, undirected forces, but rather is the result of a very specific and phenomenal design of such complexity that as amazing as the Heavens are with all their trillions of stars, the inner workings of a cell are equally as breath-taking. God made this plant, along with all the others. The proof is in the complexity and specificity of information encoded within its very DNA, and all DNA on Earth. i love this plant and i want to buy one…..where is the best place to find one …. This is one of several amazing orchids that have been called ‘Monkey Orchids’. You will notice that the orchids in the middle image are speckled, whereas the ones in the very top and bottom images are not. 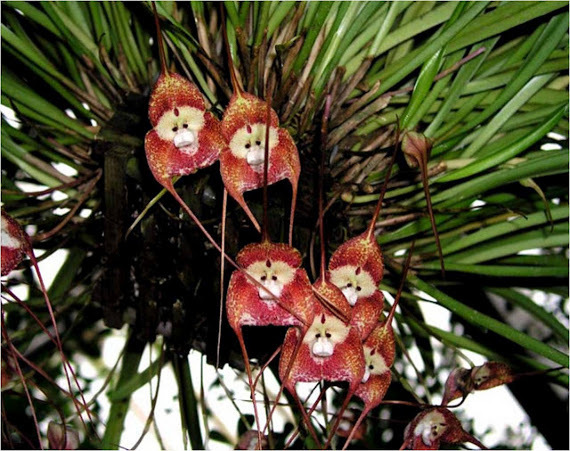 That is because these are two different species commonly referred to as ‘Monkey Orchids’. The speckled one is different species called ‘Dracula gigas’. You will also notice that the petal extensions extend straight downward opposite of the upper one. It is often confused with ‘Dracula simia’ which the name of the orchids in the other two images. Their petal extensions are splayed outward more to the sides rather than straight downward. The speckled one is different species called ‘Dracula simia’. You will also notice that the petal extensions extend straight downward opposite of the upper one. It is often confused with ‘Dracula gigas’ which the name of the orchids in the other two images. Their petal extensions are splayed outward more to the sides rather than straight downward. Rick C. Hodgin, God doesn’t exist. SJ, Psalm 14:1, “The fool hath said in his heart, There is no God.” Search YouTube for a vide, “Programming of Life”. It’s about DNA and the complexity within. It could not have happened without God’s hand. Intelligent design is a bunch of crap.though what is funny is how you are trying to connect intelligent design to religon. If you look up intelligent design offical website it even says that the goal is not to imply there is a god. But to show that there was design in what we are and not just a chance happening like evolution suggest. So please please do some more research into what you are trying to get people to read and watch. Evolution is and always has been present. And if you cannot look at the evidence that has already been presented and understand it then you shouldn’t be talking about it. Now you as a christian are going to feel the need to argue but thats alright. I wo t judge you for it. No matter what you do live for you your family and the planet you live on. Wow. I as a Christian want to argue also, but I won’t. I will just say god bless your heart and pray for you. You should do more research. Maybe read sherlocks faith, great book for everyone listed in these posts. hahahaha I do not have to do anymore research. I know what intelligent design is and how it is suppose to be a scientific process. So here do your research and look at what intelligent design science is. http://www.intelligentdesign.org/whatisid.php And stop trying to tie it to creationism and religion. It will not work. besides like I said it is a bunch of crap. evolution already has been proven. So don’t try and say it hasn’t, it is called a theory because Christians want to try and discredit it. Same with the big bang theory. It was named that by Christians in a hope to discredit it. So don’t tell me to do research. I know what I am talking about. As stated before until you are informed on the topic don’t talk about it because you are just going to come off as stupid. Is it possible to purchas a monkey orchid? Yea, one more reason to move to Ecuador! They just keep showing up…happy, happy, happy. Obama has tried to purchase a ‘monkey faced variety pack.’ for years They must have been very confident of their success when he was drawn into the second offer of that elusive damn’ Monkey thing again…..now perhaps he would have before him the actual ” Monkey Orchid group” and get the actual product. Duped again! Those monkeys left on our Air Force One for Ireland (I think) – to look up their old monkey faced group of old school chums. …Yea: I was told to look in the Himalayan mountains. On my flight there .another individual offered his plan to head to Ecuador. All this and no monkey orchid!!! Turns out,every damn monkey AND their family have traveled to the US to learn this is just the monkey’s uncle.